The wreck of this Italian trading vessel lies half a mile to the West of Dubrovnik. The vessel was originally built in 1899 in Rotterdam and was sunk during the Second World War. At the time of its sinking, the ship was carrying a cargo of tractors, many of which have now become a part of this artificial reef. 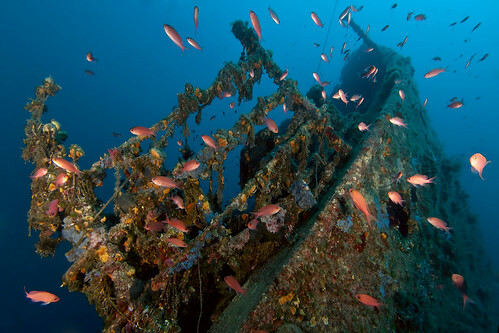 This wreck dive will take you to a depth of between 23m and 50m. Vimeo user, Tapio Helander, shot this video on a dive to the site. Mala Afrika (which translates to “Little Africa,”) literally transports scuba divers to a site they might never have expected from Croatia. Sitting between a depth of 3m and 30m, the site is accessible without a boat trip (literally by jumping off a quay) and is suitable for novice divers too. There’s typically good visibility here and you generally won’t find currents here. The site is made up of a rocky reef and cave and offers scuba divers the opportunity to encounter plenty of marine life including octopi, lobsters and moray eels. Plic Tenki is a dive site made up of shallow tunnels (4m – 9m) and a steep wall that drops around 22m. The visibility here is often good and conditions means there are parts of the site suitable for novice divers as well. Amongst the marine life this dive site has to offer are octopi and spiny spider crabs. Bisevo Grotto (or “Blue Grotto,”) is one of Croatia’s greatest scuba diving sites, offering visitors visibility of up to 30m at times! Visit at the right time of day (most often between 11am and 12pm) and the light results in the glimmering blue colour the cave takes its name from. It also causes the marine life here to look silver against the background. This dive site is not on the mainland of Croatia, but is actually off the coast of an island called Biševo. Nonetheless, it’s well worth a visit here. Whether you plan to take a diving only trip or couple a family break with a bit of diving here and there, Croatia’s subaquatic sites give its over ground sites a run for their money. If you’re planning a trip, you can bag a decent deal on a Croatia holiday here. That would be a standard holiday though with your dives to be organised separately. And of course, there are plenty of scuba specific travel companies if you opt to make a dedicated diving trip to Croatia.